I read something amazing recently in National Geographic, a magazine to which I don’t subscribe but one I love for its photos and its daringly graphic information. I get to read it in my chiropractor’s office and feel annoyed that she is never late, and so efficient about moving her patients along that I don’t have enough time for my magazine. There is a fish called a Goliath Grouper. You knew this of course. When I think of Goliath of course I remember the biblical story of the young boy David who, by dint of the Lord’s favor and a few stones, slingshots to death a huge enemy giant named Goliath. I used to think of the Church as a goliathian institution I’d never break into. 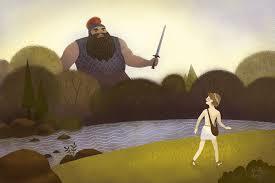 Many a dream I’d have in which I was David facing one of my many “goliaths”. Incidental trivia: the Hebrew Bible texts report Goliath's height at six cubits and a span, about nine feet, nine inches. Giant proportions, even for today's most desirable basketball team recruits. More realistic, and earlier, is the Greek translation of the Hebrew Bible which measures Goliath's height at a mere four cubits and a span, seven feet, nine inches. Were the Greeks more realistic? No, just athletes, not wanting competition. Such differences and inconsistencies ought to test my faith in biblical wisdom, and/or make me disdain the Old Testament. Instead, I'm fascinated. First, I love process that evolves. Second, I'm part Jewish, and Jesus Christ was all Jewish. We love to argue about texts. And third, I'm a woman who loves messy creative process. It's like real life; it makes me believe in the sacredness of it all because, as hard as I try, and as much as I tie my brain in knots, I can't force biblical stuff into a mold. All I can do is be wary about any claims based on the literal words of the Bible, appreciate the biblical literary composite, and love it for what it reveals to me about my relationship with God, myself, and my neighbor. That's how I can feel like David one day and Goliath the next. But back to fish................big ones. A Goliath is a huge saltwater fish, found in shallow waters among coral reefs, sometimes up to 8 feet and weighing 400 lbs when mature. A Floridian hauled in the record catch, 522 lbs., from his kayak as recently as May, 2015. The fish never hurt him but easily snapped his rod in half, and you should have heard his rapture: "Oh my God, holy crap, Jesus, oh God." The guy caught a Goliath and felt huge—enough to invoke God and Jesus. I wasn’t afraid when I saw my first Goliath Grouper because it was mounted on wood and hanging in a museum display in Boca Grande, Florida. The Goliath swims along surrounded by thousands of little Grouper groupies swarming and never raises a fin at this disturbance. Nothing fishy here and this great Goliath is a metaphor for divine constancy. Goliath has an extraordinary biology: it is born female and over a lifetime changes to male —without any gender reassignment. What is Nature thinking of here? Well, we know about that now in humans, don’t we? And we know God has no gender, don't we? Years ago when I was attending a writers’ conference and staying in a hotel—on my own. Not such a big deal, but I have to tell you that one of the mornings when I was seated at my own table eating breakfast, I suddenly felt like a man. Hey, I can do this, too! I never wanted to be masculine, well maybe the Lone Ranger yelling Hi Ho Silver, galloping on a stick horse to the William Tell Overture. But I did want to be able to do some of the things men do without batting an eye. That day, for a brief minute, I felt like a traveling businessman, a professional with my briefcase, casually eating breakfast, tossing a credit card onto the bill, and feeling like Goliath. Really. I still sometimes feel unsure of my own authority. Do I belong here? Women are priests now and still most priests are men, and “fathers” to boot. I hold my own, yet I’m tired of feeling uncertain and outnumbered. I’m immature, I say. The Church still tells women they have authority issues. I'm not alone in my Davidic feelings. But would I want to be Goliath? 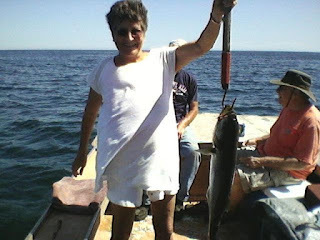 The biggest fish I ever caught was from a small lobster boat in Gloucester on my son's birthday, 2012. It wasn’t a Goliath Grouper and it went back to the deep quickly at my command and with help. But in the moment I hauled that fish in and held it up, I felt as big as Goliath and David together.